Article from ‘Rolling Stones’ Magazine about the landfill fire. An underground landfill fire near tons of nuclear waste raises serious health and safety concerns – so why isn’t the government doing more to help? 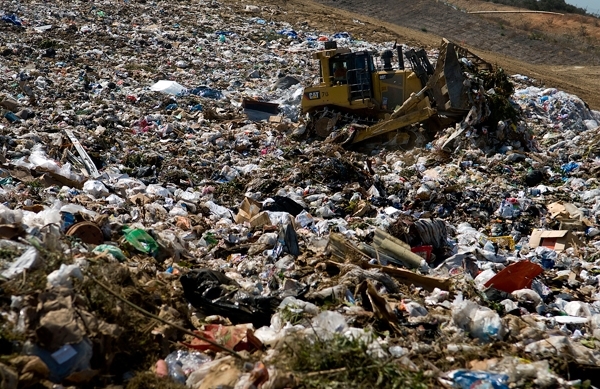 A bulldozer pushes trash in a landfill. There’s a fire burning in Bridgeton, Missouri. It’s invisible to area residents, buried deep beneath the ground in a North St. Louis County landfill. But the smoldering waste is an unavoidable presence in town, giving off a putrid odor that clouds the air miles away – an overwhelming stench described by one area woman as “rotten eggs mixed with skunk and fertilizer.” Residents report smelling it at K-12 school buses, a TGI Fridays and even the operating room of a local hospital. “It smells like dead bodies,” observes another local. In February, the landfill’s owner, Republic Services, sent glossy fliers to residents within stink radius claiming the noxious odor posed no safety risk. But official reports say otherwise. Temperature probes reveal the fire has already surpassed normal heat levels. Reports from the Missouri Department of Health and Senior Services (DHSS) indicate dangerously high levels of benzene and hydrogen sulfide in the air. In March, Missouri’s Department of Natural Resources (MDNR) – which has jurisdiction over Bridgeton Landfill – quietly posted an Internet notice cautioning citizens with chronic respiratory diseases to limit time outdoors. A month after Republic distributed its potentially misleading flier, the state attorney general sued the company on eight counts of environmental violations, including pollution and public nuisance. And this week, as part of a settlement set to be announced Tuesday, Republic sent another round of fliers offering to move local families to hotels during a period of increased odor related to remediation efforts. Nickel and Chapman are stay-at-home moms; Chapman has three special-needs kids. Neither of them wants to spend her time worrying about a damn landfill fire. But until someone higher up the power chain intervenes, they have sworn to call municipal offices, file Sunshine requests and post notices to the community’s Facebook group, no matter how unsettling the facts they uncover. Scariest of all: The Bridgeton landfill fire is burning close to at least 8,700 tons of nuclear weapons wastes. West Lake Landfill is an Environmental Protection Agency (EPA) Superfund site that’s home to some of the oldest radioactive wastes in the world. A six-foot chain-link fence surrounds the perimeter, plastered with bright yellow hazard signs that warn of the dangers within. On one corner stands a rusty gas pump. About 1,200 feet south of the radioactive EPA site, the fire at Bridgeton Landfill spreads out like hot barbeque coals. No one knows for sure what happens when an underground inferno meets a pool of atomic waste, but residents aren’t eager to find out. When Missouri Attorney General Chris Koster sued Republic Services on March 27th, outlining a host of alleged odor pollution and public health violations at Bridgeton Landfill, he described the risk of the fire contacting the nearby radwaste as a mere “remote hypothetical.” But many residents are far from reassured. The story of West Lake’s radioactive waste goes back to April 1942, when a St. Louis company called Mallinckrodt Chemical Works began purifying tens of thousands of tons of uranium for the University of Chicago as part of the Manhattan Project. Mallinckrodt’s workers did not receive adequate safety protections and had little knowledge of what they were dealing with – oversights that would lead to disproportionately high cancer death rates among workers, as documented in books, dissertations and journalistic accounts, including a groundbreaking seven-part series from the St. Louis Post-Dispatch in 1989. Over the next 25 years, the company’s uranium processing also created huge amounts of radioactive waste, much of which was secretly dumped at sites throughout the St. Louis metropolitan area, including West Lake. Today, West Lake’s radioactive waste – all 143,000 cubic yards of it – sits on the outskirts of a former quarry with practically none of the standard safety features found in most municipal landfills. No clay liner blocks toxic leachate – or “garbage juice” – from seeping into area groundwater. No cap keeps toxic gas from dispersing into the air. This unprotected waste sits on a floodplain 1.5 miles away from the Missouri River. Eight miles downstream is a drinking water reservoir that serves 300,000 St. Louisans. Worst of all: The materials dumped in this populous metropolitan area will continue to pose a hazard for hundreds of thousands of years. very well done . . . keep getting the word out. Thank you for attending the Discussion Panel meeting in University City. Sorry for the delay in our response. We have asked this questions several times of our Government Officials and we have not been given any set response to what actions will be taken in the event an evacuation is necessary. We do know that the Fire Department will be on site handling the situation based on conversations with the Pattonville Fire Department. As for what actions will be taken for the general public affected by the situation; we have been reviewing the documents at the St. Louis County Government Website. We have attached the links below. As to the countdown clock on our website; this clock was the result of a comment made by the EPA during the Meeting they held with the Public in June, that we had 400 days before the fire would reach the radioactive waste based on position of the subsurface event aka fire and the distance the SSE aka fire. If you would like to see a recording of the Discussion Panel or of any of the Community Meetings; they are online via YouTube site CWC_WLL. You will find the link to this site under at the top of the page. If you have any additional questions, please to not hesitate to ask us. We promise to respond to your questions within 72 hours of submission with an answer or to let you know we are finding the answer to the question and will post a response once we find the answer.